I have seen and eaten labong cooked in various ways across the country, in Chinese restaurants and in a fresh salad recipe using canned bamboo shoots. But this is the most common, and probably the most popular - and easiest - way to eat labong in Pangasinan. 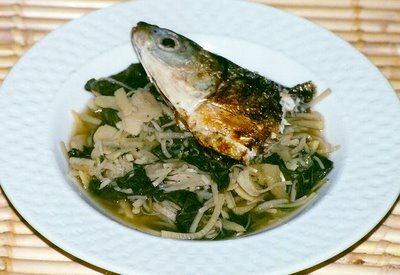 Boiled with saluyot tops (young jute leaves) and sinagsagan with inasin (bagoong isda). It is probably the healthiest among all options, because it doesn't contain any saturated/trans-fat, whether of the proven or debated kind, and the dish' nutritive value is magnified by the addition of the miracle, organic vegetable saluyot. To cook, just bring to a boil a pan of water with several slices of peeled ginger. Never, ever julienne the ginger root, as my yaya is wont to do, because it would easily be mistaken for labong, especially when using the pre-boiled one. A thumb-sized ginger, peeled and crushed with the back of an aklo (sandok, wooden rice ladle) will do. Once the water is merrily boiling, put in a small bowl a couple spoonfuls of inasin. Get a long-handled ladle and pour a ladle-full of boiling water into the inasin bowl. Using the ladle edge, crush the fish in the inasin with downward strokes. Pour into the pan, straining the inasin. Repeat until the fishbones have been finely crushed. Add the labong and let boil for a few minutes, then add the saluyot and cook for about 10 minutes, covered, on medium heat. The inasin reacts somehow with the labong, and the resulting dish acquires a very distinctive flavor, an acquired taste for some, especially for those who did not grow up eating this combination. A Pangasinense cook who maintains an eatery in Pampanga has successfully gone around this probable hindrance to the enjoyment of the dish by doing away with the inasin. He just sautees the saluyot at labong with a little pork and some tiny shrimps, recreating it into something more tolerable for non-kabaleyans. It tasted ok to my Pangasinense tastebuds, too, and it has become an alternative option whenever we run out of Pangasinan bagoong in Cavite. When I got married, I started eating labong tan saluyot soured with pias (kamias/kalamias, Averrhoa bilimbi), which is how the vegetable dish is cooked in my husband's house. It's cooked the same as the foregoing, but pias is added the same time as the ginger. It tastes not much different from the regular saluyot tan labong, but the sourness of the pias somehow foils the saltiness of the inasin, which is heightened because not much green vegetable absorbs it. It actually completes the dish, the flavors all rounded up, although of course I never noticed anything lacking before. I have come to love the taste of pias in my saluyot tan labong that I want a bowlfull of them added to the dish. Good thing there are two pias trees at my in-laws' backyard, and it is commonly available in the public markets, too. As long as labong is available (peak season is during the rainy months, but it can be procured the rest of the year, albeit rarely) saluyot tan labong, with pias, is cooked and eaten weekly at home. It serves to ground my children to their Pangasinan roots, as well as providing us complete nutrition for the day, with added anti-oxidants, to boot. Saluyot tan labong is best eaten with inkalot a bangos, and acquires a heavenly turn when the fatty head of that grilled milkfish is added towards the end of the cooking process as sahog. In fact, saluyot tan labong flavored with grilled bangus head is simply divine that I think it is worth serving in a royal court. And since it is a purely Pangasinan dish, if ever, in my other life, I had been the aliping namamahay in the court of the famed Pangasinense, Princess Urduja, I would have wanted to cook this for her. To fortify her during the battles defending the kingdom, and to keep her skin smooth and preserve her beauty to ensure that it attains legendary status. It would also serve as a reminder as to how hardy yet adaptable we are as a people, like the labong, when it grows into bamboo, which sways with the wind that's why it doesn't break, even with the strongest Filipino bagyo (typhoon/tropical storm). Of course I won't dare admit I would have wanted to be Princess Urduja herself in my other life, but I can imagine. And I imagine I would want to eat saluyot tan labong, everyday. With pias. 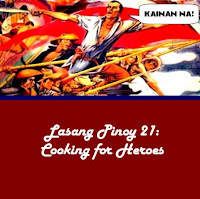 More dishes for heroes in the round-up of entries for LP21! My father is from Pangasinan and my mom is from Nueva Ecija so labong and saluyot is not foreign to me. It's not one of my fave vegies but I loved it when cooked with coco milk with green chillis together with fried daing like galunggong. I liked eating it when I'm tired of the usual meat viands. I don't understand and speak Pangasinense but I do understand Ilocano but don't know how to speak it though. Hi Gray, would have wanted to send you an email, but I cannot access your profile. The kakanin you're looking for is called Inlubi, and you can find the previous post here. I will also be doing a post-show feature later today, so I hope you come back and check it out. Copperfish, indeed, ginataan is also a common way to cook labong, outside of Pangasinan. The labong taste is heightened even more, I dare say, with gata. Since I come from Central Pangasinan we speak the pure Pangasinan language, though I can also understand a smattering of Ilocano, very basit laeng, and I can't speak it, too. kai, welcome back to blogging and lasang pinoy . . .
your saluyot tan labong entry reminds me of one of my mother's favourite up to this day . . . Your saluyot tan labong looks so rustic and hardy! I wish I could attempt your recipe, but I'm not so sure I could obtain all the ingredients here in the states. I'm so glad you're back blogging, Kai. I've missed your very educational posts! Mang Mike, food for mothers! Marvin, I was able to eat saluyot in San Francisco because some Ilocanos had planted it in the small plot at the back of their house. Such resourcefulness! And friends tell me saluyot can be procured in Asian stores. Same for labong, the canned type most probably. Hi Stef, trying to keep up with it! Randell, good for you! Try saluyot and labong sauteed with pork bits and small shrimps, seasoned with salt. I don’t remember the last time I had saluyot and labong. Labong I will surely try again but saluyot… hmmm nakupo ayaw ko na yata hahaha! But love the soup!